Is there a global crisis unravelling? World food reserves are at their lowest in 25 years and the prices of most food crops are at a record high. This is causing inflation in several countries from Egypt to China--even riots in Mexico and western Africa. Governments are in a tizzy; they are either lifting bans on import of cereals or imposing restrictions on exports. Bangladesh suspended the 5 per cent duty on wheat import. Kazakhstan announced export tariffs. India imposed a partial ban on rice export and dramatically lowered the import duties on key food items. If the current situation is grim, the future scenario is not rosy either. Global cereal prices are expected to remain high in 2008 mainly because of drought-like conditions in major cereal exporting countries and low world stocks, warns the latest Food Outlook report of the Food and Agriculture Organization (fao). It is even feared that this price rise is not a passing phenomenon. Climate change and the shift to growing food crops for biofuels would make world hunger more torturous. fao predicts that because of record freight rates and high export prices, many countries will have to pay more for importing cereals from world markets than they did in previous years, even though they are expected to import less. The world food supply is vulnerable. savvy soumya misra takes a look at the crisis, its causes and implications for India. March 2008 Kenya faces acute food shortage. Global cereal crisis is likely to hit the country the hardest because farmers growing maize, the staple crop of Kenya, have been displaced following post-poll violence. Riots over rising food prices in Namibia and Zimbabwe and several west African countries, including Cameroon, Morocco, Senegal and Burkina Faso, totally dependent on import of foodgrain. Mozambique facing shortage of 1.25 million tonnes of foodgrain. Food crisis imminent in Zimbabwe following crop failure. 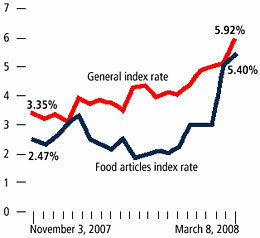 March 2008 China allocates temporary food subsidy to college students to offset inflation. The food cost in the country has soared 23 per cent after blizzards in 10 provinces of southern China destroyed crops and blocked transport links. Pork prices have gone up by 63 per cent in a year, vegetable prices have increased by 46 per cent and edible oil prices by 41 per cent. 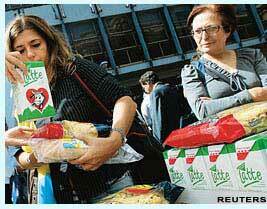 September 2007 Italy observes a day-long pasta strike after the price of pasta went up by almost 20 per cent. The price of durum flour rose from 0.26 a kg to 0.45 a kg in just two months. Italy had to import cheap durum wheat from Canada and Syria. The condition became worse when Canada refused to export and Syria imposed a ban on export of grain. 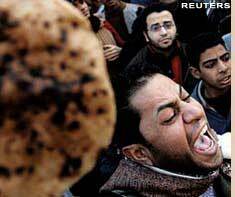 February 2008 Two people are killed in altercations while queuing up for subsidized bread in Cairo. Skyrocketing prices of wheat have forced the Egyptian government to increase the subsidy by about 52 per cent in the last one year, inflating its subsidy bill to US $2.67 billion. Egypt, the largest importer of wheat, shelled out an extra US $850 million for subsidized bread this year. Almost 40 per cent of Egypt is below poverty line and now the government has included another 15 million people in the subsidy list. June 2007 Sequential import of wheat began in India. It procured 511,000 tonnes of wheat at US $325.6 a tonne in June. The purchase rate was US $120.28 above what was paid for 5.8 million tonnes in 2006. Low support prices, private players and a drought in wheat exporting countries like Canada, US and Australia triggered panic in the Indian wheat market. India may import 3 million tonnes of wheat in the current fiscal to shore up its dwindling stocks. FAO predicts that foodgrain prices will rise for another 10 years. For most cereals supplies are much tighter than in recent years, while demand is rising for food as well as feed and industrial use. Stocks, which were already low at the start of the season, are likely to remain equally low because global cereal production may only be sufficient to meet expected world utilization. Although the world cereal production in 2007-08 is estimated to have gone up by 5 per cent, most of it is attributed to a sharp increase in maize, the main foodgrain used for biofuel. In February 2008, wheat prices rose by 15 per cent due to record low stocks and poor winter-wheat crop prospects in southwest us and northern China.Between December 2005 and December 2007, wheat prices jumped from us $167 per tonne to us $381 per tonne. The current global wheat stocks are estimated the lowest since 1982--it is expected to fall to 110.4 million tonnes by May 31, according to the us Department of Agriculture. According to fao's latest forecast, world wheat production in 2007-08 stands at 602 million tonnes, significantly below expectations and just 1 per cent more than the previous year. For 2008-09, the us Department of Agriculture forecast world wheat production to increase by 4 per cent to a near-record 617 million tonnes. But higher production will be partly offset by already low stocks. The main reason was the drought in Australia, the second largest supplier of wheat. Australia harvests nearly 25 million tonnes of wheat in a good year but in 2006 the production was only 9.8 million tonnes. Exports from other wheat suppliers like Canada, eu, Turkey and Syria also saw a dip due to unfavourable climatic conditions. 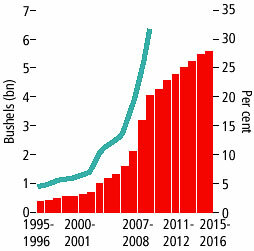 High demand for wheat for biofuel and feed further depleted the global supply. India buys wheat for the second consecutive year. 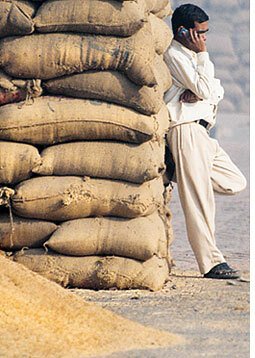 In 2007-08, India imported 0.68 million tonnes of wheat; in 2006-07 it had imported 5.8 million tonnes. Estimates suggest imports will not be required for 2008-09, says T Haque, chairperson of the Commission for Agriculture Costs and Prices. However, there are speculations that India may have to import 3 million tonnes of wheat to shore up its stocks. fao forecast slightly higher imports of wheat for China, where government procurement under the minimum purchase programme this year is down by 30 per cent from the previous season. Italy had to import cheap durum. The price of rice crossed the us $500-a-tonne mark in the beginning of March 2008, reaching the highest in the past 20 years. According to fao, demand for rice during 2007-08 is likely to be 429.2 million tonnes against a production of 429.3 million tonnes. Ending stocks are projected to be 107.6 million tonnes, up by 0.7 per cent over the previous season. Rice production in 2007-08 is estimated to increase by a mere 0.6 million tonnes. Heavy demand from the Philippines, the largest importer of rice, and African countries. Supply shortage in Pakistan, where electricity crunch has hampered mills from functioning at full capacity. Ban on export by India and China. In March 2008, India banned export of the non-basmati variety at less than us $650 per tonne. The move was to compensate for wheat shortage in procurement for the public distribution system. However, India partially relaxed the ban for Madagascar, Mauritius, Comoros Island and cyclone-hit Bangladesh. China banned exports to ensure domestic availability. Vietnam sold broken rice to the Philippines at a record us $750 per tonne. India allowed export of 3.2 million tonnes of non-basmati rice in the first half of 2007-08, but since October no new contracts have been signed. In Thailand, rice and wheat prices went up by 30-40 per cent in the past three months. Exporters in the country are hoarding rice and wheat in anticipation of a further rise in prices. Pakistan saw a 60 per cent jump in price in the past few months. Between December 2005 and December 2007, the price increased from us $103 a tonne to us $180 a tonne. Despite a record 9 per cent production growth in coarse grain -- the bulk of which came from maize -- in 2007-08, the maize price peaked at a 10-year high of us $220 per tonne in February 2007. It has now breached the us $230 per tonne mark. Strong demand for biofuels coupled with a steady growth in demand for animal feed, particularly in Europe. The us supplies more than 60 per cent of world maize exports. But in 2007-08, a quarter of the us maize--that is 11 per cent of the global maize crop--went into biofuel production. us , the largest market for ethanol, used almost 54 million tonnes of maize for biofuel in 2006-07 and is estimated to have used 81.3 million tonnes in 2007-08, according to fao. In the past one-and-a-half years, soya bean and palm oil rates have seen a sharp increase. In fact, the rise in the prices of edible oils was the sharpest among all food items, and is likely to continue. The price of palm oil rose from us $350 per tonne to us $1,250 per tonne in the past one year. Soya bean price has increased to us $499.43 per tonne in a year. According to fao , increase in oilseed production in 2007-08 is less than 2 per cent over the previous year. Palm, palm kernel, copra, rapeseed and groundnut oil production is likely to see a sizeable increase, while a fall is anticipated for soya bean and sunflower seed oil. Biofuel accounted for almost half the increase in the worldwide demand for vegetable oils last year, according to Oil World, a forecasting service in Hamburg, Germany. Rising consumer demand in China and India. Floods in Malaysia, one of the big producers of palm oil, led to a shortfall in production. Palm oil is being accepted as a healthier option to trans fats. When a store in Chongqing, China, announced a cooking oil promotion in November 2007, a stampede in the store left three dead and 31 injured. Last year, China was the world's biggest palm oil importer. Malaysia cleared tropical forests to make way for palm plantation to meet the demands of the European nations for biofuel. An increase in per capita income has led to a greater demand for meat and milk products worldwide, inducing a price rise. India and China have seen a significant shift in this regard. With increasing consumption of livestock products more grain is being diverted as feed. Today 200-250 million tonnes more grain is being fed to livestock than 20 years ago, according to fao. It forecast an increase in production of beef and sheep and goat meat owing to a growing demand in developing countries. Developed countries will witness a fall in the meat production. Asia, especially China and India, is estimated to have witnessed maximum growth in milk production. According to the us Department of Agriculture, milk prices jumped 12 per cent in 2007 and production is expected to rise by 2.7 per cent in 2008. In India, milk and egg prices have risen by about 20 per cent in a year. 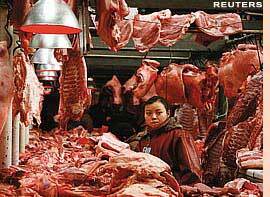 In China in 1985, a person on an average ate 20 kg of meat annually. Now he consumes almost 50 kg. eu expects milk demand to rise in 2008. The European Commission predicts the need for an additional supply of about 8 million tonnes of milk in eu by 2014. Clearly, there is a mismatch between demand and supply of cereals. And the factors contributing to this widening gap are more than just population growth. Although the reasons for shooting prices vary from cereal to cereal and region to region, there are certain overarching trends that have contributed to the crisis-like situation. While climate changes played spoilsport by constraining supply, biofuel and changing dietary preferences pushed up demand. Fall in soil fertility and rise in prices of fertilizers, due to increasing cost of oil, and seeds raised production cost. The search for solutions has divided the world between those advocating GM crops and those opposed to it. "In 1973, a jump in oil prices had doubled grain prices and now oil is again set to change the trend in grain prices. Only this time there is a search for a substitute for oil," says Ramesh Chand, national professor, Indian Council for Agricultural Research, Delhi. Globally, the shift towards biofuel and cereal being used for the production of ethanol are being seen as the main factors pushing up foodgrain prices. More and more land is being diverted to biofuel than to food. Since most of the maize, used as cattle feed, was being diverted to biofuel, its prices shot up and wheat soon replaced maize as feed in several countries. 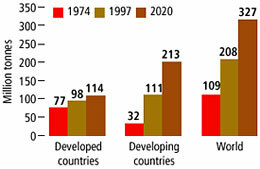 Much of the 5 per cent growth in global cereal production in 2007-08 is attributed to a sharp increase in maize output. In the us, one-fourth of the total maize production and one-fifth of the total corn output is being used for biofuel generation. The us plans to increase its biofuel production from the targeted 34 billion litres in 2008 to 136 billion litres in 2022, of which 75 billion litres can come from grain. 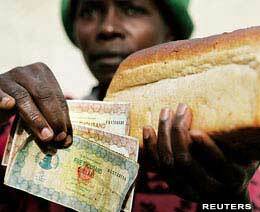 This impacts the food price. According to a World Bank report, filling up an suv with ethanol once means having used up enough maize to feed a man for a year. Stavros Dimas, European environment commissioner, admitted that the eu had underestimated the dangers of food shortages and rain forest destruction when setting a binding target for 10 per cent of all eu fuels to come from "green" sources by 2020. According to eu, its biodiesel industry uses 60 per cent of the rapeseed oil output. In the us, the biofuel industry is likely to absorb 20 per cent of the domestic soya oil production. According to a 2007 study by the International Water Management Institute, China aims to increase biofuel production fourfold to 15 billion litres of ethanol-9 per cent of its projected petrol demand-by 2020, from 3.6 billion litres in 2002. India is also focused on ramping up ethanol production. In October, the government approved a plan to require oil companies to sell petrol with a blend of at least 10 per cent ethanol by next year, which is double the current levels. The study states that to meet their biofuel targets, China will need to produce 26 per cent more maize and India, 16 per cent more sugarcane. "We need to understand the cost of producing biofuel. Not only will we use fossil fuel to run biofuel plants, we are also clearing fields and forests to make way for biofuel crops," says Praveen Jha, professor, Centre for Economic Studies and Planning, Jawaharlal Nehru University (jnu), Delhi. The impact of climate change is beginning to show across the world (see box Weather beaten). Drought-like conditions in major cereal producers Australia, European Union and Canada have affected cereal production. Central Asian countries are facing extreme cold conditions with temperatures dipping to a 25-year low, hampering agriculture. A December 2007 report by the International Food Policy Research Institute, Washington, warns that climate change is likely to add to food insecurity, further fuelling prices. The report, World Food Situation New Driving Forces and Required Actions, projects that by 2020 the production of all agricultural produce in developing nations will decline by 20 per cent, while that in industrial countries by 6 per cent. It estimates that a 3C rise could lead to a 40 per cent increase in the prices of foodgrain. fao, in a recent report, said agriculture in the Middle East and North Africa will suffer losses because of high temperature, droughts, floods and soil degradation threatening the food security of many countries. "The number of dry days is expected to increase everywhere in the region. The number of frost days should decrease, while heat waves in the region's more continental areas might become more frequent. As a result, the length of growing seasons should decrease," said Wulf Killmann, chairperson of fao's working group on climate change. The Nile delta and the Gulf coast of the Arabian peninsula are particularly vulnerable to floods. Another trend contributing to the rising prices of foodgrain is the growing demand for meat and other livestock products. The dietary shift is directly related to a rise in per capita income in developing countries, especially India and China. Increased meat consumption, in turn, stoked the demand for cereals to feed animals. As maize was diverted to ethanol production, wheat was diverted as feed. Diversion of maize to biofuel and the rising demand for feed pushed the prices of other feed like barley and sorghum. fao estimates a record production of coarse grains in the us, Brazil and Mexico owing to a high demand for biofuel and feed. Higher economic growth in Uganda, Angola and Mozambique, is leading to a preference for rice, which is easy to cook and cheaper to import than be grown domestically. The trend is also prominent in low-productive eastern and southern African countries. Depletion of natural resources is also hampering agricultural growth. A report published in January 2008 by uk -based consultant Bidwells Agribusiness states that scarcity of water and arable land prolonged food inflation. Richard Warburton, the head of Bidwells Agribusiness, says, "Sustainability will ultimately be defined by food production per area of land and quantity of water used, as these are the obviously limiting factors." Can India insulate itself from the rise in global food prices? Answers are neither certain nor unanimous. While some economists believe that price rise is a cyclical phenomenon and will be under control within three months, others believe the trend is here to stay. However, with the inflation rate keeping above the 5 per cent rbi limit for three consecutive weeks, one thing is clear the government needs to act. The agriculture ministry estimates a bumper 76-million-tonne wheat harvest this rabi season, but the Institute of Economic Growth, Delhi, pegs the figure at a maximum of 73 million tonnes. The Commission for Agriculture Costs and Prices also warns of an overall increase in the price of essential commodities in 2008-09. Traders and farmers also expect that supplies would be tight this year. "The production is estimated to decrease by 20 per cent if the temperature does not dip by early April," says Parikshit Singh, a farmer at Haryana's Tarawari grain mandi. He has a reason to worry, for the wheat yield is susceptible to slight temperature variations (see box Degree of yield). "The prices are high because there is shortage of grain supply in the market and demand is high," says Mahavir Prasad, a trader at the Narela mandi in Delhi. Wheat is going at about Rs 11,000 per tonne, up from Rs 9,000 a tonne in April last year. Prasad and other traders believe it will rise to Rs 13,000 per tonne in the new season, while the government has fixed the minimum support price (msp) at Rs 10,000 per tonne. Surjit Bhalla, the managing director of consultancy firm Oxus Research and Investments, has a different take. 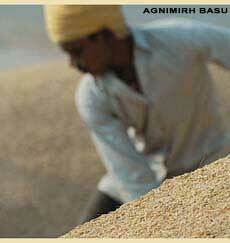 "The prices of foodgrains in India have stabilized in the past few months. And this year they are going to improve since Australia and India have increased acreage of wheat. In India, the area under wheat has increased by 10-12 per cent," he says. Himanshu, associate professor of economics, jnu, also thinks that domestic supply is not a problem. "2004-05 was the last bad agricultural year after which food production improved. The production of rice and wheat was above the target last year," he says. This view, however, oversees the fact that unfavourable weather in India can diminish the yield, while over-production could lead to a glut in the market. There is an additional threat this year a wheat fungi capable of completely destroying the wheat produce, is moving eastward (see South Asia Wheat fungi may have reached Pakistan). Major wheat-producers in Asia, including Uzbekistan, Kazakhstan, India and Pakistan, have been put on high alert. There are reasons beyond demand and supply that can influence prices. "Agriculture is largely energy-intensive. And with the crude oil price touching the us $110-per-barrel mark, the cost of agricultural inputs like fertilizer and pesticides is bound to increase, thus, increasing the price of food," says M S Swaminathan, agricultural scientist. If Indian consumers have not quite felt the pinch that is because prices have been controlled by subsidies. "Although India has raised the msps, it has kept the pds prices unchanged. As a result, the food subsidy bill has gone up to more than Rs 31,000 crore (from Rs 24,000 crore in 2006-07). Similarly, the fertilizer subsidy bill has gone up to Rs 41,000 crore (from Rs 25,900 crore in 2006-07). This is the buffer protecting Indian food prices from rising at the same rate as global prices," explains Ashok Gulati, director (Asia), International Food Policy Research Institute, us. According to the institute's director-general Joachim von Braun, however, the current global food price crisis is "worse and more long-lasting" than that of early 1970s. "Apart from subsidies, the fact that we are producers of paddy and wheat helps. We are able to meet 90-95 per cent of our foodgrain requirements through what we produce. We need to import a marginal quantity and even if it is at a higher rate, the domestic prices are controlled," adds Bhalla. But as Himanshu points out the problem does not lie with supply as much as it lies with faulty foodgrain management and procurement. India had to import wheat in the past two years despite good production. "Private players procure at a rate higher than the msp and then the government has no option left but to import at higher rates," explains CSC Shekhar, assistant professor, Institute of Economic Growth, Delhi. "There is a need to de-link the msp and the procurement prices. The government should purchase foodgrain from farmers at the current market rate," adds Shekhar. * Quintal= 100 kg; In this case the MSP is just Rs 76.48 higher than the cost; the difference depends on demand and supply of a crop and its importance for food security. In case of poor yield due to unfavourable weather or bad inputs, the farmer will have to bear the loss. The current pricing process takes into account the rates of various inputs fertilizer, seeds, electricity, water, etc. But usually, the time gap between setting the msp and procuring the product is large and during this period input costs often go up substantially. 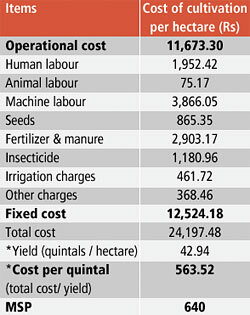 Though the msp gives a margin of 15 per cent over the total input cost, Swaminathan argues "that is not enough" and prescribes a margin of at least 50 per cent (see table Small margin). While yield varies across the country, the msp is fixed (see table Regional imbalance). "The whole set up of the msp should be changed," he adds. The National Commission of Farmers, headed by Swaminathan, has recommended giving farmers a lucrative offer to cut imports. The offer should be in the form of support prices in the beginning of the season to help farmers decide the economics of the produce, and procurement prices at the time of buying the produce. In case the government goes for imports, farmers should be given smart cards that would give them concessions on seeds and fertilizers. The proposal is under discussion. To control prices the Indian government will have to aggressively procure foodgrains. It is believed that if India ends up procuring even 1 to 2 million tonnes of foodgrain from the international market, the prices will shoot up. Estimates of low winter oilseed yield add to the fear. Already, domestic prices of edible oil have been growing at a rate higher than the wholesale price index. On March 17, the finance minister assured the Rajya Sabha that the government would do its best to control inflation to ensure that it did not hit the poor. What followed was a ban on the export of edible oils. India has already banned export of wheat and set minimum export prices for rice. It drastically reduced import duties on palm, mustard and sunflower oil. The government has also done away with the import duty on semi-milled or wholly milled rice. Banning exports is a short-term measure to control inflation. It is also anti-farmer, say experts. Already there is resentment in Kerala over ban on export of coconut oil and the lowering of import duty on its substitute, palm oil. "There is a lot of untapped potential in eastern India. There is a need to introduce the right technology, train farmers in multiple cropping and empower them to utilize government schemes," suggests Swaminathan. very informative & eye opener article. Need input from you for one of the Community Meet I plan to organize as an awareness.
" employers challenges to feed employees 2020-2050 "